You just found out that your employer is transferring you to the other side of the country, and you have to move within a month. You obviously need to sell your home ASAP, so… what do you do? If you’re like most people you feel obligated to ‘fix up’ the home and do all sorts of little repairs before putting it on the market. Otherwise, you’re thinking, no one will ever buy it! Heaven forbid your home not be ‘HGTV ready!’ I can definitely understand your line of thinking, and honestly, you may actually be right. But most people overthink and over-analyze what they need to spend their precious time and money on to get it ready to sell. Not every dollar spent is wise. Some updates or repairs may increase your homes value, while others may not. For example, if you live in an average, middle-class neighborhood in Anytown, USA, where most homes have Formica or solid-surface countertops in the kitchen, you sure as hell don’t need to go spend THOU$AND$ on granite or quartz countertops. In your area, it’s probably not necessary and surely won’t increase your homes value enough to warrant it. So what DO you want to invest in to help your home stick out from the competition and sell faster (and for more $!)?? Let’s consider for a moment, the Pareto Principle aka the 80/20 rule. In 1906, Pareto was doing a study and discovered that 80% of all the land was owned by 20% of the people. He also noticed that 20% of the pea pods in his garden contained 80% of the seeds. It’s the same thing today. Today, approximately 80% of the wealth is owned by 20% of the people. The 80/20 rule applies to most things in life. 80 percent of a business’s income is going to be derived from 20 percent of their customers. If you go to a job, 80 percent of your income is going to be derived from 20 percent of your work. 80 percent of our value to that person is derived from 20 percent of our work. You can apply this rule to damn-near everything in your life. You might wonder what all of this means. In a nutshell, it means that some things are substantially more important than other things. In other words, things are not equal. Approximately 20% of what you do matters. The other 80% is insignificant. How can you apply the 80/20 Principle to selling your home? Because so many Realtors and sellers buy into the false idea that more is more, they completely ignore the Pareto Principle. The 20% is vital and the 80% is trivial. Now that you know what the 80/20 rule is, you probably want to know how to use it when you are selling your home. When you use the 80/20 principle to sell your home, you aren’t trying to sell people on the entire home. You know that 80% of your home’s features are trivial. That is because they are the same features that all of the homes in your neighborhood have. Instead of focusing on those trivial features, you need to focus on the vital & more attractive features. These features make your home unique. These features will make it easier to sell your home for the full asking price. Most homes these days, especially homes around the median-home price in your area, still do not have any smart home features in them. Those that do may only have a Nest Learning Thermostat, but not much else. Here lies the opportunity; Since 80% of your home is just like everyone else’s home, let’s strategically invest some $ into upgrading your home with some basic smart home technology. For just around $1,220, far less than replacing countertops would set you back, you can upgrade your home to be a smart home. Specifically, this will get you some Phillips Hue smart light bulbs, one August Smart lock for the front door, one Nest Protect smart smoke + CO detector, and one Nest Learning thermostat. You can even pick all this stuff up at your local Home Depot or Lowe’s and be installing it later that same afternoon! For more detailed info on how much this stuff costs, and why you want it in the first place, please read my article on LinkedIn Pulse about the true cost of a smart home. Imagine for a second that a prospective Buyer is going to check out a home for sale. They walk up the front steps and are greeted with a fancy-schmancy August Smart lock on the front door. It’s the very first thing they see! So right off the bat, this home sticks out from the others and has a cool, sleek piece of modern smart home tech that 98% of others do not. Inside the home are little notecards posted in a couple different spots, just quickly highlighting the other smart home devices that the home has, and what they do. After seeing the rest of the house, they’ll leave and never have to worry about forgetting this house. 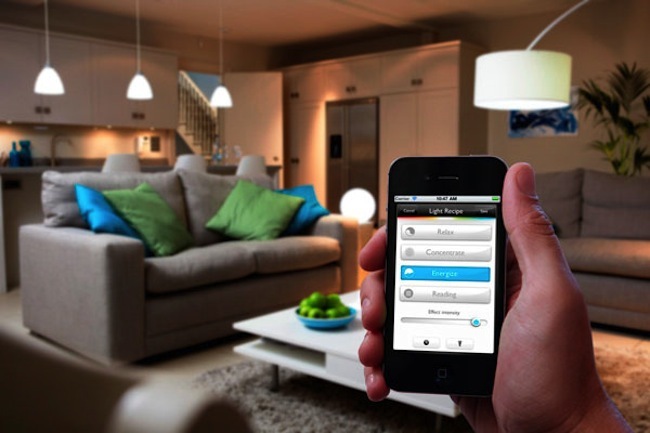 It just has so many cool smart home technologies that you just don’t see anywhere yet. They’ll probably even nickname this home ‘the smart home,’ and it will forever stick in their mind because of all the unique technology it has that they have probably never seen before. Later that night they narrow down the list of homes to a very select few. You’d better believe that your unique and cool ‘smart home’ is at the top of their list. Weeks later you complete the sale, and Mr & Mrs Buyer can’t wait to show their friends the cool smart home technology their new home has. Thankfully you, as the seller, decided to spend around $1,200 and update your home with smart home tech, rather than piss thousands more away on unnecessary new countertops. About the Author: The above article on Selling your home Faster with Smart Home technology was written and provided by Dustin Brohm, a leader in the field of Real Estate sales, marketing, and smart home technology. Dustin can be reached via email at [email protected] or by phone at 801-455-8753. Dustin has helped many people buy and sell Salt Lake City area homes for years.